On February 16, 1954, The Washington Post television correspondent Laurence Laurent reported that CBS would begin airing The Morning Show, their answer to NBC’s popular Today. It featured Walter Cronkite and Charles Collingwood and the puppets of Bil and Cora Baird in CBS’s New York studio. This knocked Roy Meachum off the local airwaves in Washington where he had been hosting Meet Roy Meachum during that same 7:00 – 9:00 AM timeslot on CBS affiliate WTOP-TV. Meachum continued with his regular radio show and looked for other TV opportunities. 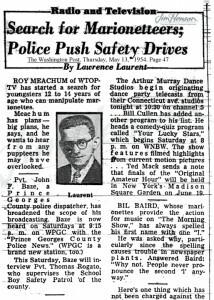 Laurent’s May 13, 1954 column gave a clue to Meachum’s next step: he was searching for young puppeteers for an unnamed project. Meachum’s idea was a children’s version of CBS’s Morning Show with kid anchormen and, instead of the Bairds, kid puppeteers. 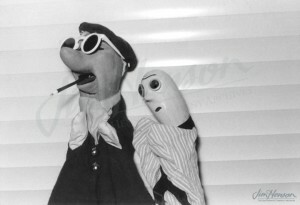 He advertised in various ways (some versions of the story say that the producers visited the puppet club, Les Petit Players, at Jim’s high school) to recruit talent. Jim saw this as a way to get into television and, at 17, went to the library to learn about puppet making, made some puppets, auditioned with this classmate Russell Wall and got the job. The Junior Morning Show started airing June 19, 1954 and reportedly lasted just two Saturdays. 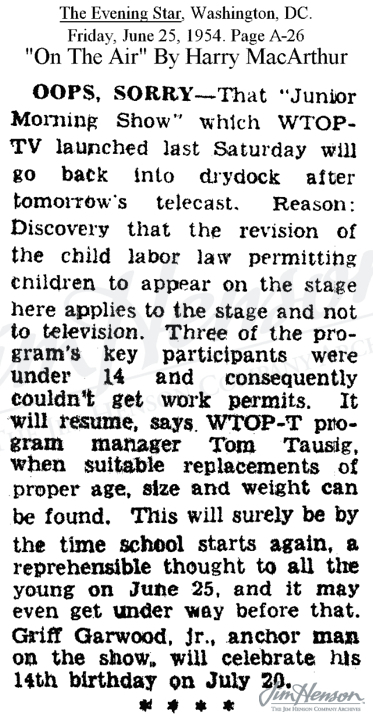 On June 29th, Laurents reported that, “WTOP-TV’s ‘Junior Morning Show’ bowed out last Saturday after three [sic] performances, but the program will return. 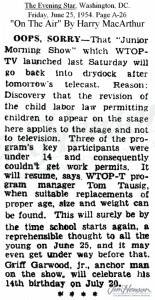 Station officials were pleased with the programs, but some of the youngsters were under 14 years of age and this made their working illegal.” While the show never was revived, Jim’s talent was pointed out to a director at NBC’s Washington affiliate WRC-TV by Meachum, and later that summer, Jim was hired to perform puppets on various shows there. Learn more about Jim’s time at Northwestern High School and what he did in those first months at WRC-TV. 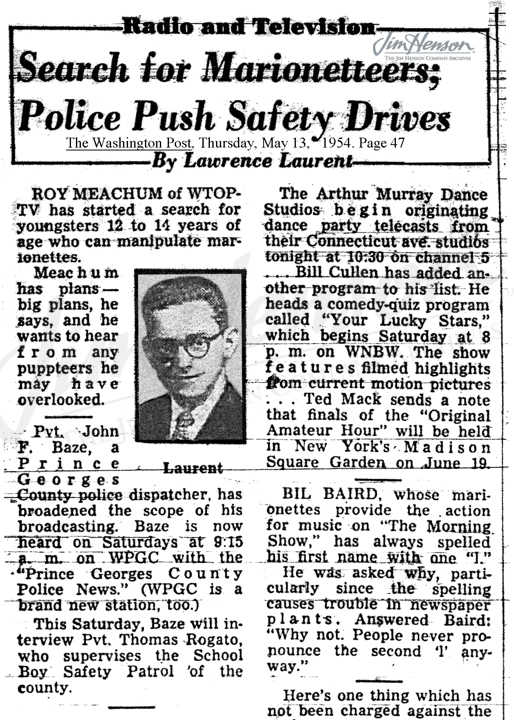 Lawrence Laurent’s May 13, 1954 column mentioned Roy Meachum’s call for young puppeteers. Note the charming mention of established puppeteer Bil Baird on the right. 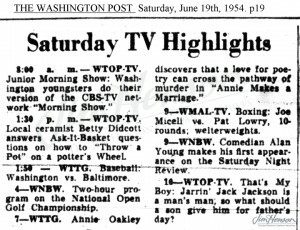 The Washington Post’s listing and description for The Junior Morning Show, June 19, 1954. Harry McArthur’s June 25, 1954 column in the Washington Evening Sun about the cessation of The Junior Morning Show. His prediction that it would be revived went unfulfilled. Pierre and a friend – two of Jim’s very first puppets, 1954. 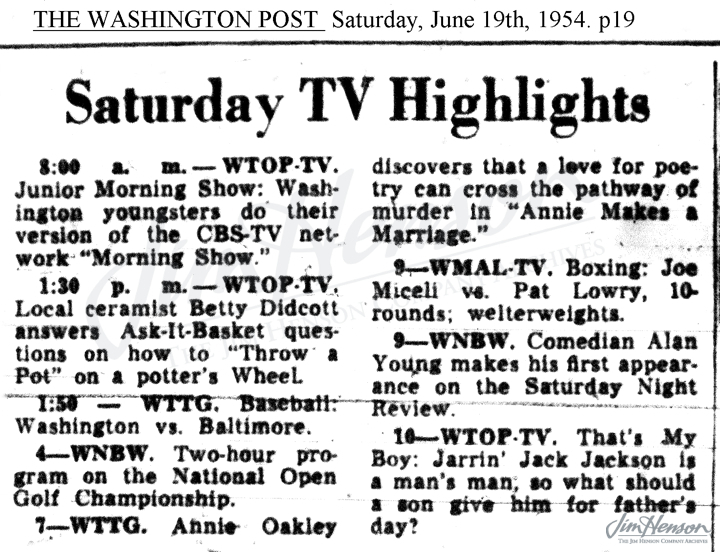 This entry was posted in 06-June '54, 1954 and tagged CBS, Charles Collingwood, Laurence Laurent, Roy Meachum, Russell Wall, The Morning Show, Walter Cronkite. Bookmark the permalink.